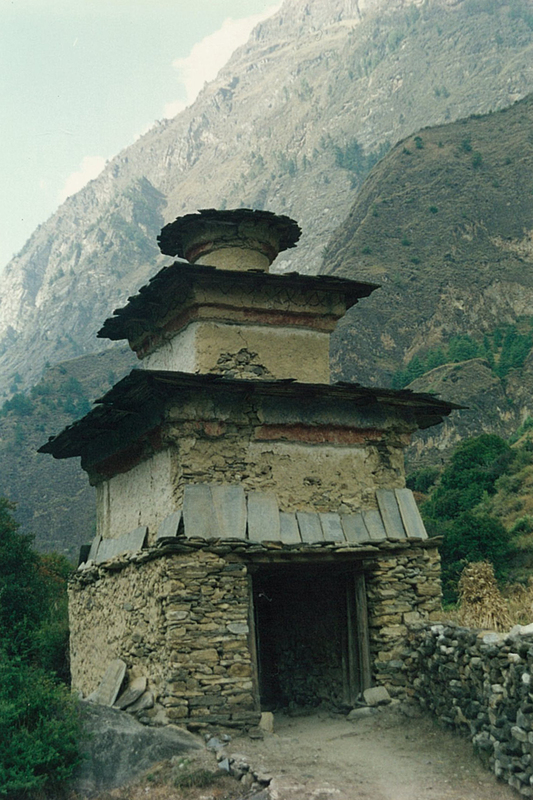 Chorten; the Tibetan word for a stupa, a mound-like Buddhist structure. Col; a pass or depression in a mountain range or ridge. Dal Bhat; the standard Nepali meal consisting of steamed rice, lentil soup and often served with local seasonal vegetables. Dhanyabaad; Nepali for thank you. Durbar; a traditional city centre/square. Ghat; series of steps leading down to a Hindu holy river. Jatra; a street festival or carnival. Kani; an arched stone gateway normally astride an entrance to a village. Kharka; the Tibetan word for a (high altitude) meadow. Khola; a Nepali word for a river. Koshi; another Nepali word for a river. La; the Tibetan word for a mountain pass. Lama; a Tibetan Buddhist monk. Lhosar (or Losar); a Tibetan word for New Year. 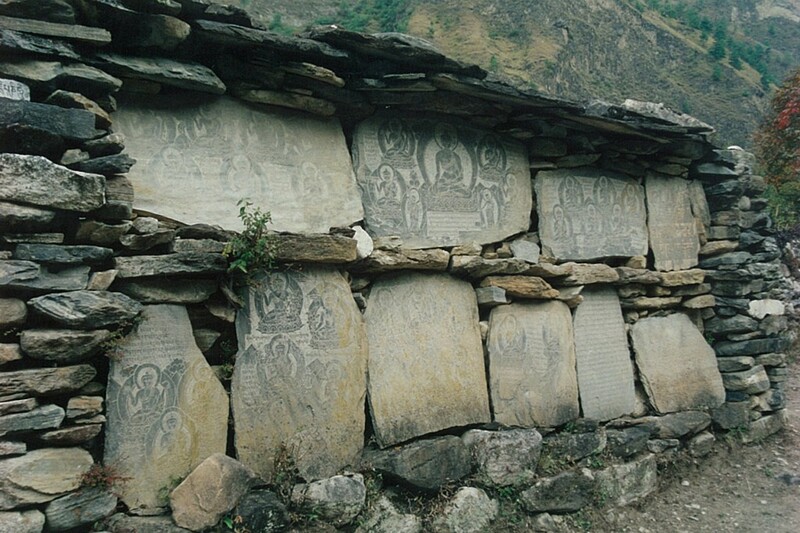 Mani; a wall of inscribed stones. These walls should always be passed or circumvented in a clockwise direction according to Buddhist doctrine. (Except in the Bon Po areas of Dolpo where they should be passed or circumvented anti-clockwise). Monsoon; the rainy season, from early June to late September. Moraine; an accumulation of unconsolidated glacial debris (mainly rocks). Namaste; hello/good day in Nepali. Newar; the people and language of the inhabitants of the Kathmandu Valley. 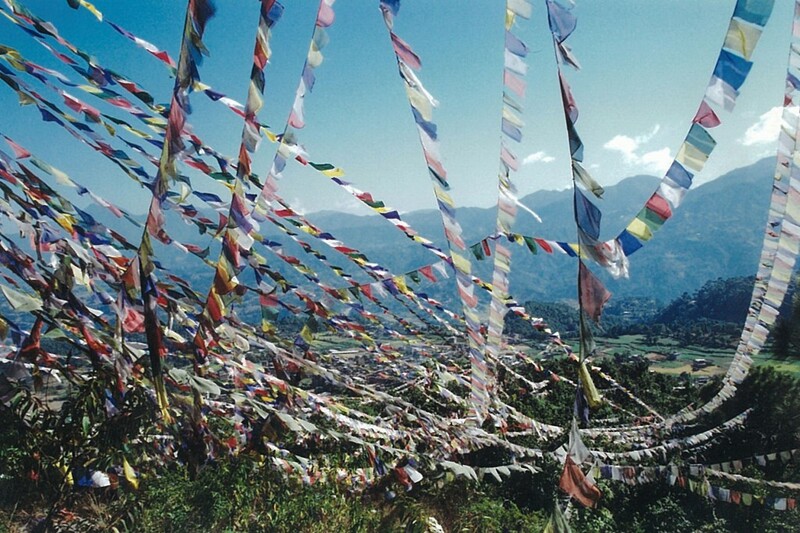 Prayer Flags; colourful blue, white, red, green and yellow, representing the five elements, rectangles of cloth often strung out in the Himalayas. Puja; a Hindu and Buddhist religious rite/offering. Sadhu; an Indian ascetic or holy man. Sadhvi; an Indian ascetic or holy woman. 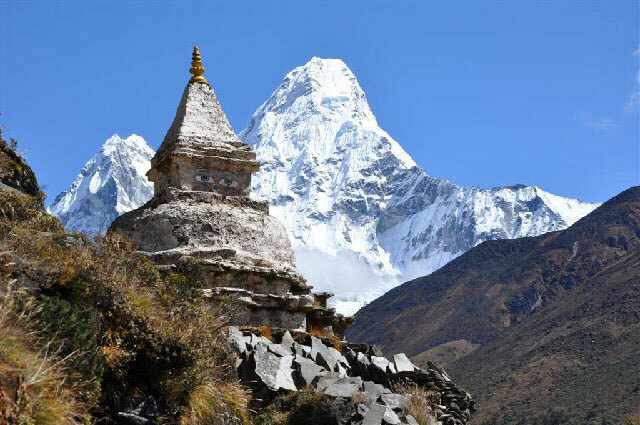 Stupa; a mound-like Buddhist monument. Tashi Delek; hello/good day in Tibetan. 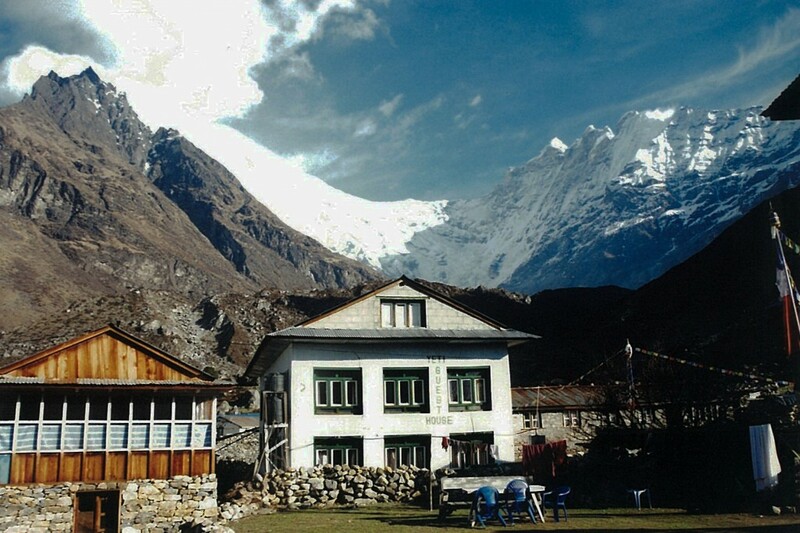 Tea-shop or tea-house; a small lodge which provides accommodation and food with some basic necessities for sale. The Terai; the lowland plains that border North India. Thangka; a Tibetan silk embroidery, usually religious. Yak; basically a high altitude long-haired cow with short, thick legs, humped shoulders and large upcurved horns. Strictly speaking the yak is the bull and the female is a nak or dri. Many of those that you come across are the result of cross-breeding with cattle and are known as dzo (m) or dzomo or zhom (f). Yeti; sometimes known as ‘The Abominable Snowman’ this mythical (?) creature inhabits the mountains and occasionally attacks livestock and humans. So watch out folks.